LC: Can you talk about how this project became such a passion for you? JB: Sure! Two and a half years ago, Sam Register, who is head of Warner Bros Animation, told me they have the rights to this book called Bunnicula. It’s about a vampire rabbit who drains vegetables, and I knew that was something I’d love to develop, I loved the idea of it. That’s when it started. The first thing I did was just a one page drawing of Bunnicula’s expressions, and a vibe of what he would look like. I sent that back to Sam, and he said “We love it, this is great! Let’s keep moving forward,” and from there we started storyboarding the pilot. From day one, I loved the character, because he’s very cute, but he has this polar opposite side where he can also have a demon face or be completely scary at the same time and I like that contradictory personality type. LC: How far removed from that first model sheet that you designed was the finished look of the character? JB: Not at all, I just streamlined it a bit to keep it a little more animation friendly. Actually, if you compare them, they look pretty much the same. LC: This show is a gateway for kids who might be slightly into scary things or maybe even those who need to get past being afraid of things. Can you talk a little bit about that aspect of the cartoon and some of your favorite monsters in the show? LC: What can we expect from this first season? JB: There will be some really fun ‘monster of the week’ episodes. The first ten to fifteen episodes are about a monster or ghost who’s in the apartment and needs help, and how Bunnicula interacts with them. Lots of new supernatural creatures. 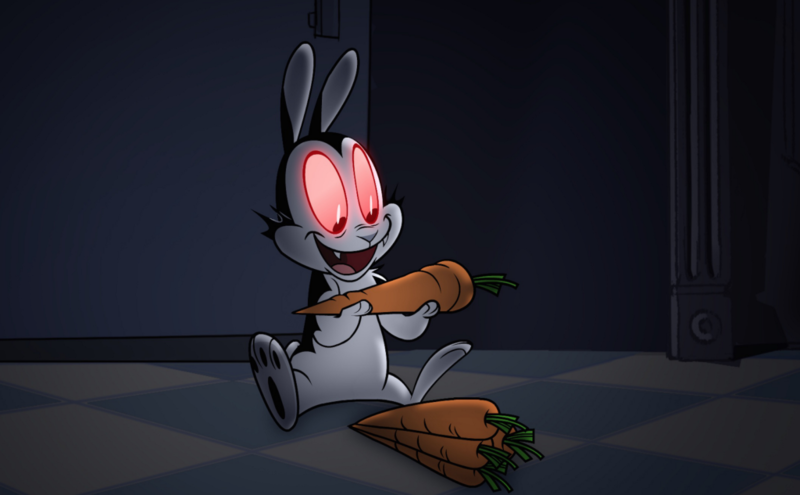 We don’t go too far into Bunnicula’s origin yet. We’re going to save that for the second season. We learn more about these characters, and how they each react to different situations, and what Bunnicula is all about. For example, different vegetables give him different power-ups, and we’ll talk about his relationship dynamics with Harold and Chester. It’s more about meeting monsters and having fun in this spooky New Orleans setting. LC: Mina is a new character in the mythology of Bunnicula. She’s not in the books. I love her because I assume it’s a reference to the original Dracula! JB: Yeah, originally it was just two boys and a mom and dad. It was in Middle-America, and this is New Orleans with a little girl and her father. We never get into their family, because we just wanted to keep it focused on the animals and the supernatural. We’ll learn more about Mina and her backstory during the second season. We also have a character that’s this deranged guinea pig called Lugosi, who is kind of modeled after Renfield from the original story. Some of his lines are referenced from that character, but we called him Lugosi as a throwback to the old Dracula movie. We’re going to keep playing with stuff like that. Bunnicula has all of the characteristics of a vampire as well. He turns into mist, and he can reappear, he doesn’t have a reflection, he can’t go into a home unless he’s invited, so he has those vampire traits. LC: For the multilayering of kids and their parents watching it together, which is always the goal, I want to mention that Sean Astin is the voice of Chester. You’ve said he was the hardest character to design. JB: Yeah, I found the cat design harder to get. Cats look a certain way, and I wanted him to look stressed out. I had a hard time figuring out shapes and the structure of his skull. Some characters, Bunnicula for example, took about ten minutes to design, whereas I probably had a few days at my drawing table working with different cats. He was originally gray, and we had some sample animation that people saw and went “Oh my god, he looks just like Tom from Tom and Jerry”. So we made him Siamese, and I love that because I think that breed of cat is more mysterious, and they have strong personalities. I don’t think they’re the friendliest cat. LC: As a woman representing leadership in TV animation, what do you hope girls will take away from your work, or what advice would you give concerning their careers? JB: That’s a good question! I never think of these things, because I usually just do the work. I don’t think about how I’m a woman doing this, I just think “I’m doing it”. I’d say, just stay true to what you think is interesting in stories, and characters, and just create stuff that you want to watch. That’s all I ever do. I just want to make things because I want to see it. I think when you work in that kind of pure form, people respond to that because it’s real. You’re not trying to be someone else, you’re not trying to make a show that you think other people will like. If you’re making it for you, people will respond to that because it’s more genuine. LC: Absolutely! You are leading by example. Things are really starting to skew to the girl side! JB: I know, and it’s crazy, because I’m only 32, and when I transitioned from school into the workforce, the girls were gone! I’m really excited to hear that it’s more balanced now, because that gives more perspective. I think better shows will be made that way, with different visions and things like that, so that’s great!